As I sit here, all by myself on the 1st anniversary of finding Travis body- I vividly recall events during those excruciating three days. Three days of uncertainty, three days of the emotional roller coaster. So much has happened- so much has changed – yet- so much is completely the same. I have seen many signs the past weeks and days. I wanted to go back to the land, the site where Travis last took his breath. I hoped to spend time in solitude with the earth, God and with Travis. I hoped to find answers, feel something, anything. As I was driving, I passed a large freshly tilled field. The black dirt was covered with thousands of small birds. As I drove closer- I couldn’t determine what kind of bird they were. How I wish Travis were with me, he always knew the answers. I slowed my speed as my car approached the field. Suddenly, thousands of beautiful white birds we’re flying above me. My heart was immediately filled with warmth – it was Travis – could these birds be doves? They were much too small to be white geese? It had to be Travis! He was speaking to me through the birds – he was giving me a sign. My heart swelled with love…. my love was giving me a sign! 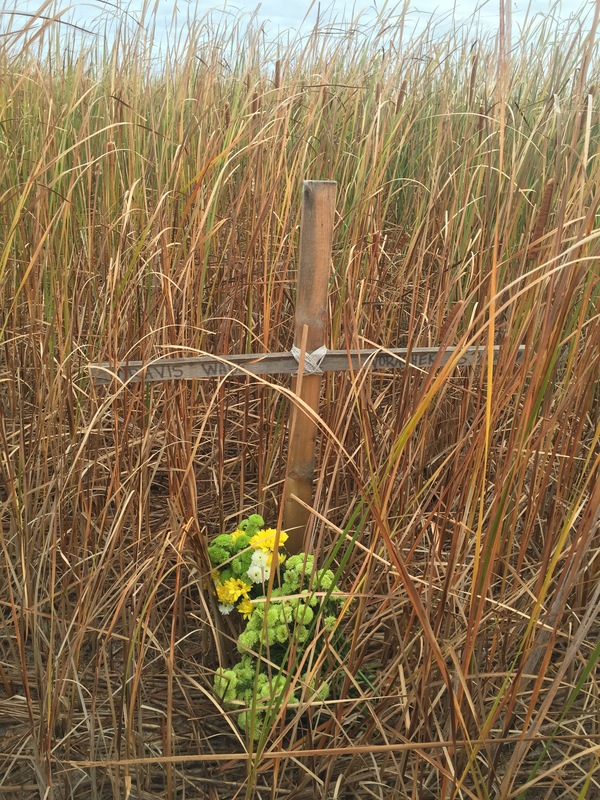 As I carefully found the county gravel road and turned west- I wondered – would I find the cross that I placed months prior? I hoped no one touched it or vandalized it. When I see cat tails and water – my mind immediately pictures the land where Travis died. Maybe it’s a little ptsd? I was soon entering the gravel roads which were surrounded by cat tails and water. I waved and hid my tears when I slowly passed a pickup from Wisconsin – hunters with their camouflaged boat. I was jealous – jealous that they travel all this way and are able to hunt. How Travis loved hunting. Entering the land – my heart started to beat more rapidly. I could vision the ambulances, the sheriff vehicles, the Red Cross, the command site, the air boats, the helicopter, the hundreds of people, atvs and vehicles, the cadaver dogs. I still cannot believe it all really happened. It happened to my Travis! I didn’t dare drive my vehicle down the entire dirt road- how I wished I had kept Travis pickup. I stopped and parked my car near where the command site was located. I decided to walk the distance. I was prepared- I have my daughters water boots, a coat, hat and the flowers. I wondered what Travis would say —- more flowers…. The dirt road was taken over by unkept grass. It has rained immensely in the county — I was lucky to be wearing the water boots. As I walked – i talked to Travis. Again asking – why , what happened to cause the atv to flip, what caused him to end up face down in the water? Did he suffer? Was he scared? When did he actually die? The three evergreens— these are my markers of where to be. I saw freshly mown grass and corn dispersed for the upcoming deer seasons. Memories flooded my mind- Travis would take the apples from our tree to lure deer, he would be viewing his deer cam photos for the “trophy buck”. This deer season- he will be guiding others from up above. I turned and walked to the north and searched for the cross. The land was taken over by 5-6 feet tall cattails. No paths, just thousands of thick cattails. Again, my mind flashed to Travis wondering, helpless, how did he end up deep in the cattails, near the water, in the water? After walking a distance – I found it. The cross that I pounded into the earth months prior was still there! My flower vase was now shattered into pieces. My writing on the cross was worn from the rain, wind and sun. I made a mental note that I need to make a better cross. The tears fell, the anger took over, I sobbed, i wept, missing him so terribly- feeling the gut wrenching pain. The pain and loneliness will never go away. If only I could see him, touch him, hold him… I cried out to him. Begging him to come home. Begging him to love me again. Begging him to let our lives return to what they once were. My tears and anger were distracted by a lone (one) Duck which flew above me. The duck was singing all by itself …..
Travis may not be physically with me- but I knew that Duck- that quack- that sound which bothered me while he practiced his calls in the garage …. today that sound was very comforting . Prior to Travis death- ducks and geese were just birds- now- when I hear their sound- their wondrous “guacks” my heart is warmed, I immediately smile and think of Travis. Remember how he’d practice his goose calls in the garage (all the time! ), the smile on his face and twinkle in his eye as he’d pepare for his next hunt. Now – I look forward to the sound of geese and ducks in the sky. A few days ago, 11-6-16 (the one year anniversary of his death) I was full of emotion. I found myself outside, sitting in our deck wrapped in the pink fluffy camouflage blanket Travis brought me years prior (that’s another story). I was warmed by the soft cozy blanket. I was looking at the stars- talking to my Travis. Asking him to always be with me. Asking him to give me the strength that I need, telling him that I can do this – as long as he stays by my side. It was completely dark out- just me and the stars and Travis. I was weeping- missing him so- asking him to be with me—– all of a sudden I heard it again, more quacks from a single Duck. It was him! He was with me! He was telling me that he will always be with me and our children. I sat there, wrapped in the blanket and smiled. All of the sudden, my entire being felt warm- I was being held by my love! Later that evening, I was emotionally and physically tired. I had many bouts of tearful episodes throughout that day. I decided to go to our bed and hold his pillows. Hold the new teddy bear my sister gave me (made out of Travis dress shirts). I have kept our window open for the fresh air. I was sobbing, crying in bed as I do every night since he went missing. This night was harder than the past few. How I missed him terribly. How I wanted him to hold me, to kiss me, to lay next to me, to be with me in our bed. I begged him to talk to me in my dreams and let me remember in the morning. I begged him to be with me – to make love to me. Then I heard it — the quacks of a lone Duck outside our window. I can’t describe it other then what it was- Travis again was trying to communicate with me- he was with me. Maybe not physically – but he was with me! I smiled as tears fell onto his pillow, I cried softly so the children could not hear me. I felt safe, loved, supported- I felt Travis near me.